It’s that time of year when sparkly and bright packages arrive in the house smelling of yummy things. 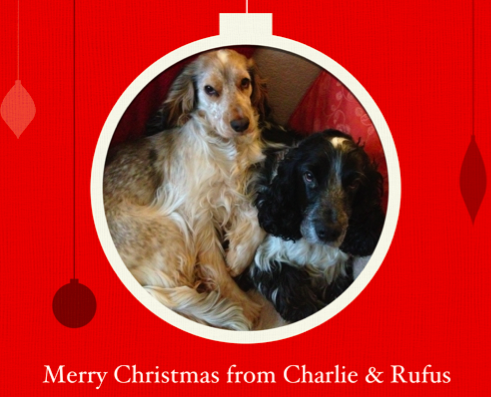 This will be Rufus’ first Christmas and I have told him all about Santa…..only five sleeps to go! Christmas is great fun with new toys, chews and goodies but on a more serious note, it is important that items containing human chocolate and other foodstuff are kept well out of our reach. They smell great to us but can be poisonous. Mum put the decorations up today so our house is decked with seasonal greenery and glittery things. No tree this year in case Roo thinks it’s indoor plumbing! Many people in Cumbria will not be having a great Christmas this year and that some of our four legged friends are separated from their owners whilst houses are dried out and rebuilt. We send our warmest wishes to all and hope everyone gets back to normal soon.